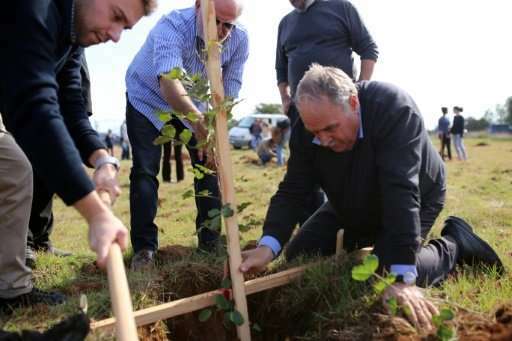 A group of men plant a carob tree during the first stage of a project in Oreites, near Paphos on November 26, 2017 aimed at reviving the Mediterranean island's " black gold"
Nearly 6,000 carob trees were planted on Sunday in Cyprus as the Mediterranean island seeks to revive its tradition of producing "black gold". "We're going to plant 40,000 carob trees before the end of March," said Constantine Christophides, a professor at the University of Cyprus who heads the project. In three or four years, these trees could produce 10,000 tonnes annually of carob, which is used to make syrup, a sweetening agent or in animal feed. That represents around one fifth of the carob produced on the island at its peak in the early 20th century. "In 1900-1910, we exported 50,000 tonnes a year," Christophides said, adding that the substance was then considered the "black gold of Cyprus". Cypriot carobs, long pods filled with black seeds, were popular from Europe to Britain and Canada. Income from the trees enabled many families living in the countryside to put their children through school. But carob trees were abandoned and production fell as new generations moved to towns and cities. The university project, carried out in collaboration with Cyprus' Agricultural Research Institute, aims to produce carob food, drinks and other items locally. "The carob is an organic substitute for cocoa, for example," said Christophides. The professor said laboratory tests were being conducted to develop, among other things, new carob-based drinks or drugs based on its beneficial properties for digestion. "It's a great opportunity to revive that tradition, to bring the carob tree back to Cyprus and to enrich the environment," said Evdokia Constantinou, one of the volunteers who came to plant trees on Sunday. "Cyprus was covered with trees in antiquity and now we have lots of places where trees don't grow because of lack of precipitation."